So you’re not enamored with all those plastic-looking, artificial, “low maintenance” decks. You like Real Wood. It’s beautiful, it’s strong, it’s renewable; it’s Nature’s Gift to you. But which wood should you choose for your deck? Over the next few blogs, I’ll review some of the best wood choices. “PT” — Pressure Treated southern yellow pine – is the original long-lasting decking. Pine’s wide, open grain readily accepts the preservatives, and these preservatives give PT its lifetime warranty against rot and termites. There are several different chemical mixes, but they all preserve the wood similarly. Pressure Treating companies add copper because it’s a natural fungicide and eliminates rot. But copper gives PT its characteristic – and unpopular — greenish color. As for the termites who want to eat your house frame into splinters – well, you might like this. The chemicals bond with the wood sugars and make them indigestible to the termites. They can eat the transformed wood, but they starve. How fitting. Still, the lifetime warranty comes at a price. The preservatives enter the wood in a solution of water, lots of water. 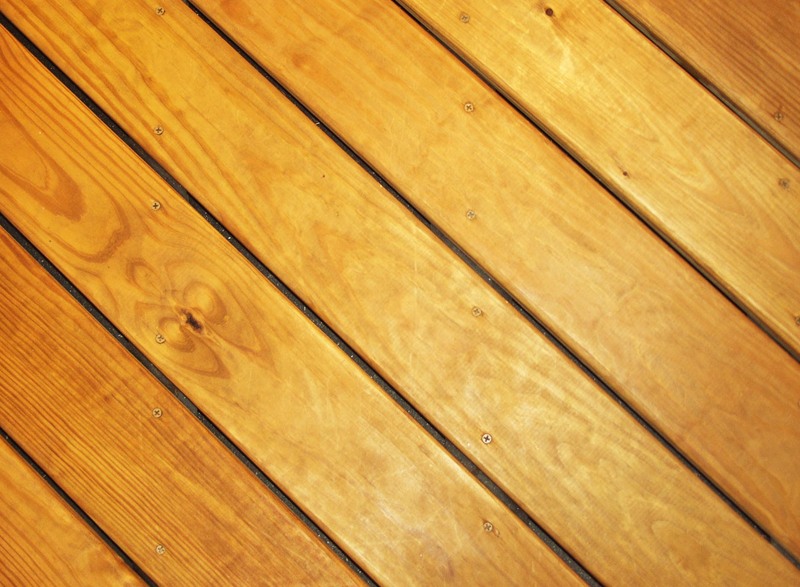 As all that water evaporates over the first few months of a deck’s life, the wood shrinks – and cracks. These cracks are “checks,” which do not compromise the wood’s strength or integrity, but they do mar its appearance. PT misbehaves in other ways too. The floor boards can cup, rail 2x4s can twist, and balusters can warp. Some of the new PT has so much copper that it is corrosive and requires special fasteners. There are options and improvements. Paraffin enhanced PT wood has been available for decades; the paraffin repels water and helps PT survive its first year more gracefully. New micronized PT is kinder to its screws and lacks that greenish tint. 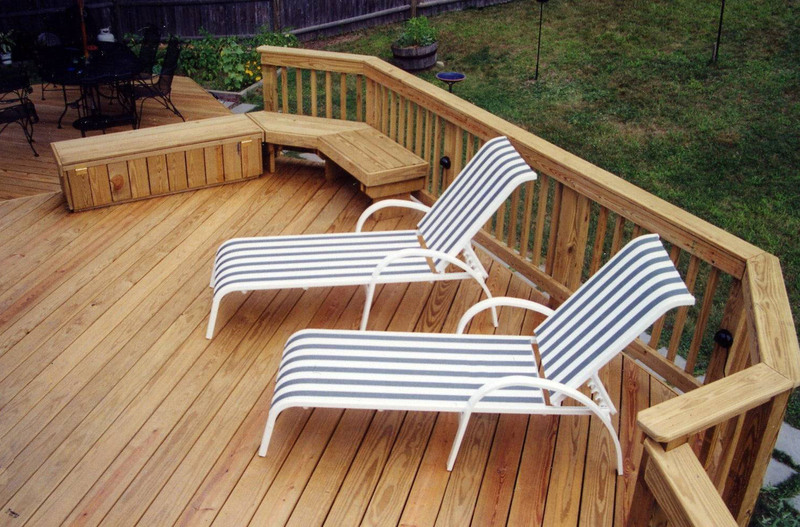 To keep your PT deck looking good, you should treat it with a quality preservative; and most preservatives will also stain the wood an attractive, warm color. Some manufacturers in the southeast US offer high quality PT that is kiln dried after treatment and thus more dimensionally stable so it does not warp and twist like standard PT. Another specialized option that’s available is fire retardant PT. So, PT decking has an attractive wide grain, it accepts a wide range of stains; and it’s fairly hard and strong. It has that lifetime warranty, and…it’s the least expensive outdoor wood. Not bad. My next blog considers mahogany. From the US Department of Agriculture, about the chemicals in PT wood: http://www.fpl.fs.fed.us/documnts/techline/whats-in-that-pressure-treated-wood.pdf. US EPA safety statement and guidelines for using ACQ and Copper Azole pressure treated wood: http://www.epa.gov/pesticides/antimicrobials/reregistration/cca/safetyprecautions.htm. Effective preservative stains for PT wood: http://www.cabotstain.com/products/product-type/Staining%20Products.html, and http://www.woodsealants.com/. We at Advantage Design & Construction offer professional design and build services for clients west and north of Boston. Over the past 26 years we have designed and built over 950 projects. We have enhanced the depth of our expertise by limiting our work to decks, porches, and sunrooms. To view some of these projects, visit our website. To learn how we treat our clients, check our ratings on Angie’s List or read a recent article about us in Remodeling Magazine. For a free design consultation and a relaxed and rewarding experience, contact us via e-mail, subboston@archadeck.net or by phone, 781-273-3500. NextIs Mahogany too expensive for your deck?